by Syed Salahuddin, Reuters. August 7, 2001. KABUL (Reuters) - Afghanistan's ruling Taliban Tuesday brushed aside international criticism over the arrest of 24 foreign and local staff from an international aid agency for promoting Christianity, saying those detained had insulted Islam. The Taliban's religious police in Kabul arrested Sunday eight foreign staff including two Americans and 16 Afghan workers with German-based relief agency Shelter Now International. Mohammad Salim Haqqani, Taliban's deputy minister for the Promotion of Virtue and Prevention of Vice, showed reporters computer discs containing the story of the life of Christ in Dari language as part of evidence collected from the SNI agency workers. for an SNI radio broadcasting, and what he called a written confession of a foreign female staffer of the German-based agency. ``Are these not valid and strong evidence?'' Haqqani asked. Proselytizing is punishable by death under the strict interpretation of Islamic Sharia law imposed by the Taliban. The United States, Australia and Germany all said they were concerned for their nationals -- four Germans, two Australians and two Americans -- and were seeking access to them through their diplomatic missions in neighboring Pakistan. ``We have our concerns too. A fair one and is that these people strongly insulted our religion and traditions. 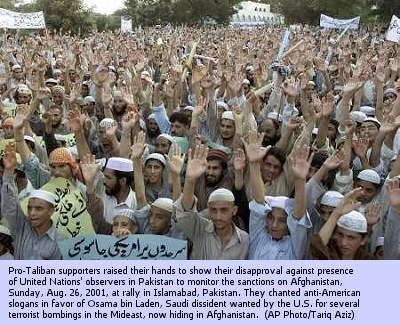 The concern shown by foreigners is not justified,'' Haqqani told Reuters. Haqqani said the Taliban's supreme leader, Mullah Mohammad Omar, would make the final decision on how to proceed. There has been no indication from Omar whether he will show flexibility and bow to international pressure. One Kabul-based aid worker said she was more concerned for the fate of the 16 Afghans than for the foreigners. Australian Foreign Minister Alexander Downer Tuesday rejected charges the Australians had spread Christianity. ``They may be Christian but they are not there to undermine Islam and spread Christianity. They are there to help with problems of poverty in Afghanistan,'' Downer told reporters in Canberra, adding he would like Pakistan's help to resolve the issue. Pakistan, one of only three countries to recognize the hard-line regime as Afghanistan's government, appears to have some influence with the Taliban, although the movement ignored appeals from Islamabad and other countries not to destroy ancient Buddha statues this year. Spokesmen at the U.S. and Australian missions in Islamabad said they still had no official confirmation of the arrests, but a German embassy spokesman said the German arrests were confirmed. He named the four detained Germans as Georg Taubmann, Katrin Gelinek, Margrit Stebner and Silke Durrkops. Taubmann is believed to head Shelter Now operations in Afghanistan. A statement issued by the foreign ministry in Berlin said Germany, the United States and Australia had agreed to work together to seek a solution. ``At the moment it is being tried to establish access to those arrested via the International Red Cross in Kabul,'' the statement said. The International Committee of the Red Cross (ICRC) in Kabul said it had offered to visit the foreign detainees. A spokesman for Shelter Now International in Germany, which is also known as Shelter Germany (www.shelter-germany.de), said those arrested had no connection to the U.S.-based Christian relief agency also called Shelter Now International. The U.S.-based SNI (www.shelter.org) earlier said although it did have a presence in Afghanistan, the detainees were with a German group that used SNI's name without permission. The Taliban say they have also sent 59 children who were being taught by the arrested workers to a correctional facility, where they would remain until all traces of Christianity were removed. Official Taliban news sources have said authorities had recovered bibles, and that the arrests were made while the foreign workers were showing an Afghan family material about Christianity on a computer.